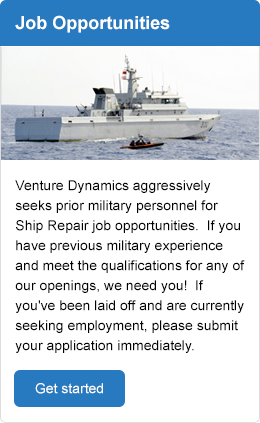 Venture Dynamics is a Premium source for skilled tradesmen and craftsmen. Our business is maximizing workforce productivity through custom staffing solutions while minimizing customer's labor and administrative costs. We have effectively streamlined the hiring process so that our customers can meet project deadlines without going over budget. 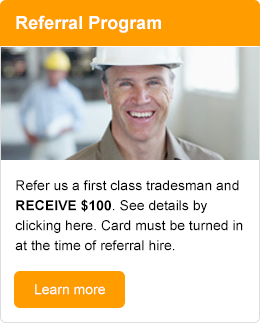 Our customers can enjoy a better bottom line while knowing the skilled labor they need is always readily available. Imagine being able to bid on multiple contracts or taking on various projects without the time and costs associated with hiring new employees. With a proven and qualified workforce representing the full spectrum of trades, we take care to fully understand our customer's particular skilled trade requirements to match with a highly skilled candidate. Our experienced staff ensures our customers receive the best candidate for the position without a lengthy turnaround time. By acting as the perfect liaison between a skilled worker and a company that requires their service, we are able to build lasting partnerships with not only our customers, but with our workforce as well. Our workforce includes highly experienced and skilled tradesmen that have been in the industry for years. All candidates are screened, safety trained, and supplied personal protective equipment. They are also required to attend an 10-hour OSHA Compliant Safety Training class and must pass a VSRA approved safety test as a hiring condition. We are capable of providing QP1 Training and Firewatch training, if needed. We believe that exceeding our customer's expectations is a necessity. Venture Dynamics strives to take all of the legwork out of the hiring process so our customers can focus on getting their project completed. Our customer service is exceptional and we are committed to providing our customers with top notch care. Contact us today to see how Venture Dynamics can save your company time and money! "As a result of their quality workmanship, productivity, and responsiveness, Venture Dynamics has developed an outstanding working relationship and has become one of our most reliable suppliers." - J.E. Gerdes, Director of Contracts, Maersk Line, Ltd.
"The workers hired from Venture Dynamics blended seamlessly with our workforce and enabled us to complete our job on time and on schedule....."
"consistently provided skilled tradesmen commensurate with their resumes and our expectations....."